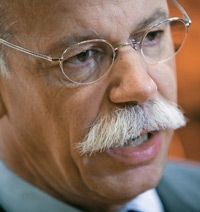 Daimler's Dieter Zetsche, shown, may provide a Mercedes platform to Renault-Nissan's Carlos Ghosn for a new Infiniti. That was just one of several possible collaborations announced or hinted at during the Paris auto show. PARIS -- Alliances were the talk of the biennial Paris auto show last week, as the industry rebuilds from its toughest year in decades. -- Nissan-Renault boss Carlos Ghosn said he's still interested in General Motors Co. as he strengthens ties with Daimler AG. -- A Nissan Motor Co. executive said his company is in advanced talks with Daimler about using a Mercedes car platform for the Infiniti brand. -- Daimler CEO Dieter Zetsche talked of a hybrid alliance with Toyota Motor Corp.
-- In Sweden, BMW AG and Saab Automobile announced an engine partnership, with more cooperation on the way. -- And Volkswagen AG Chairman Ferdinand Piech said buying Fiat S.p.A.'s Alfa Romeo is still very much in his sights. "We are patient and have time," Piech told reporters. Within hours, Fiat CEO Sergio Marchionne fired back at VW: "Let them wait." It was a sharp contrast to the Paris show four years ago, when Ghosn strode briskly into a packed ballroom just off the Champs-Elysees and proclaimed that his companies were "very interested" in forging ties with GM. Within days, GM would spurn the overture, stay the course and continue its slide into bankruptcy. Economies of scale, electrification and increased synergies across rapidly expanding global markets. "The final consumer will not give us more money," Bosch Automotive Chairman Bernd Bohr said during an interview before the Paris show. So "we as an industry have to organize ourselves differently. "And organizing differently in our industry usually means realizing economies of scale, which can be done by standardization -- not everyone making everything and everyone making something a bit differently." In addition, the rapid emergence of the so-called BRIC countries -- Brazil, Russia, India and China -- has many companies thinking they can't capitalize on the growth opportunity without help from a partner. And stricter emissions rules across the globe are driving home the realization that automakers can't afford to do everything. In an interview, BMW CEO Norbert Reithofer said: "As we look into the future, a lot of players know that if they move forward toward the electrification of cars, they have to invest a lot of money into research and development. I think you are more flexible with cooperation agreements." Bosch's Bohr said the financial stress comes from researching a host of alternative powertrain options while improving existing internal combustion engines to cut emissions and boost fuel economy. "I think we will see, between some of the Japanese makers and some of the European makers, different forms of alliances," he said. First, though, it was a Swedish-German partnership. Saab and BMW signed an agreement for BMW to supply engines for Saab's next-generation 9-3. Under the accord, BMW will provide Saab with a four-cylinder, 1.6-liter, turbocharged gasoline powerplant in 2012. The engine currently is used in the Mini. Asked why Saab isn't creating engines itself, CEO Jan Ake Jonsson said, "It is too expensive to develop your own engine." In the meantime, Ghosn said he's focused on expanding his companies' ties with Daimler. "We know we have a powerhouse," he said. "When you add the r&d of Renault, Nissan and Daimler, we are the largest in the industry. We have every kind of technology, particularly if we get organized within ourselves. It can be a competitive advantage." For now, the Renault-Nissan work with Daimler is limited to light commercial vehicles, powertrain sharing and development of the Smart car and the Renault Twingo. Ghosn said that once those projects achieve their "breakthrough," cooperation among the three automakers could expand into such areas as electric vehicles and battery development. Nissan also is talking with Daimler about using a car platform for the Infiniti luxury brand, said Colin Dodge, a Nissan executive vice president. The companies planned to meet last week to iron out details, such as selecting Daimler diesel engines to be offered with the Infiniti model, Dodge said. And, in a flashback to 2006, GM is in the picture again. Ghosn said last week that a tighter alliance with Daimler would not necessarily quash a potential deal with GM. Some areas, such as shared development of a minivan, would not conflict with any areas of Daimler products, he said. Separately, Daimler's Zetsche confirmed that his company has been discussing shared hybrid technology with Toyota. He cautioned that the companies are "just testing the water" and said he did not expect any "concrete potential outcome in the short term." "Our priority is Renault and Nissan," Zetsche said. And then there's VW's Piech, who has set his sights on Alfa as the next brand in an expanding empire. Fiat sources say Piech has been courting money-losing Alfa since the summer of 2009. They say he has made several attempts at buying the brand, mainly to help VW's Audi compete directly with Mercedes-Benz in a scenario that then would allow a VW-owned Alfa to take on BMW. Marchionne, for his part, said he has "no intention at all of selling Alfa." He expects to launch Alfa in the United States in late 2012 and achieve volumes of 85,000 vehicles two years later. Piech, meanwhile, said nothing would happen with Alfa for at least two years. Yet he only stoked speculation when reporters persisted with questions about VW's adding the Italian make to its stable of a dozen brands. Said Piech: "Thirteen is my lucky number."